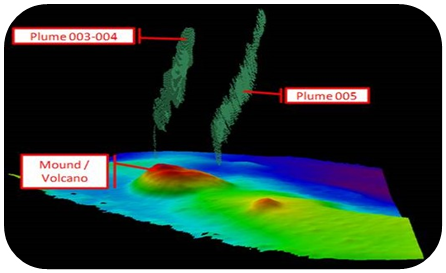 Surface Geochemical Exploration is a petroleum prospecting tool based on the premise that traces of upward migrated petroleum from deep source rocks and reservoirs can be detected in selected seabed sediments and used to evaluate exploration potential. Deep seismic and multibeam surveys are used to select piston coring locations based on surface expression of deep faults and other features related to conduits for upward migration of hydrocarbons. 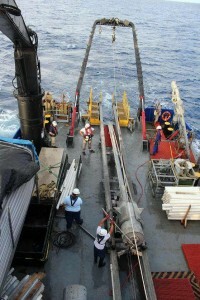 The science and art of this seep hunting involves (1) proper selection of core sites from the seismic records, (2) safe and skillful acquisition of seabed cores at these exact sites, (3) analytically distinguishing promising samples from samples with varying levels of natural background concentrations, and (4) properly interpreting the geochemical results in a geologic context. TDI-Brooks uses a sequence of specific procedures that we developed and improved over several decades. Our method consistently yields highly accurate identification and a quantitative evaluation of potential sites with migrated oil. Our interpretation of survey results is made even more robust by comparison with our world-wide database of SGE survey results from 100,000+ samples we have collected, analyzed, and interpreted over the years. We add our knowledge of historical background levels of the analytes for an area, environmental factors, and any unique characteristics of the region being sampled. The process consists of the following sequential steps: Core Site Selection, Core Acquisition, Laboratory Analysis, and Interpretation. 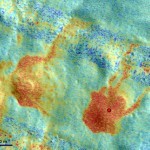 Seeps can have a bathymetric or backscatter signature on the seafloor, or both. TDI-Brooks and our partners have been involved in the design and execution of numerous ‘seep hunting’ MBES programs. TDI-Brooks operates two vessels with Kongsberg MBES systems, the RV Gyre and RV GeoExplorer, and has chartered third party vessels equipped with similar MBES systems suitable for seep hunting missions. Multibeam echo sounders, like other sonar systems, emit sound waves in the shape of a fan from directly beneath a ship’s hull. These systems measure and record the time it takes for the acoustic signal to travel from the transmitter (transducer) to the seafloor (or object) and back to the receiver. In this way, multibeam sonars produce a “swath” of soundings (i.e., depths) for broad coverage of a survey area. Survey speed is typically higher than seismic operations (up to 10 kts). The area of coverage on the seafloor (swath) per ping depends on the depth of the water, seafloor composition, and the operating frequency of the multibeam sonar. Echosounders that transmit low frequency sound can travel a longer distance in the water (increased range and coverage) but have a lower resolution and are less precise. Sound from high-frequency echosounders cannot travel long distances in water but achieve a higher resolution and are more precise. Most mid to deep water MBES systems are capable of meeting the resolution / data quality requirements for seep hunting missions. 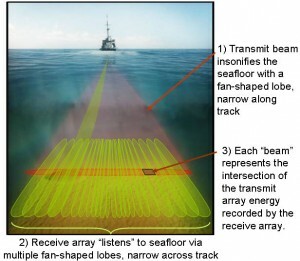 In general, lower frequency MBES systems will allow for increased coverage and reduce survey time, but this may be offset by higher vessel costs, as these system typically require a larger vessel to mount the transducer arrays than higher frequency systems (which use smaller transducer arrays). Bathymetry grid showing typical expulsion features (mounds and pockmarks). Hydrocarbon seeps occur as point sources or clusters of point sources due to the vertical migration of hydrocarbons focusing into vertical chimneys. Hydrocarbons will follow a path of least resistance while migrating and therefore tend to form relatively small pathways compared to the overall volume of rock and sediments. 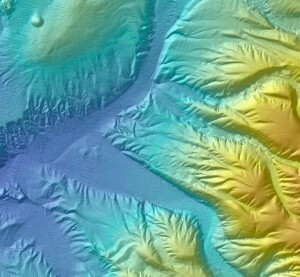 As a result, surface expressions of seepage occur as discrete features, often with bathymetric character, such as a mud volcano or pockmark. 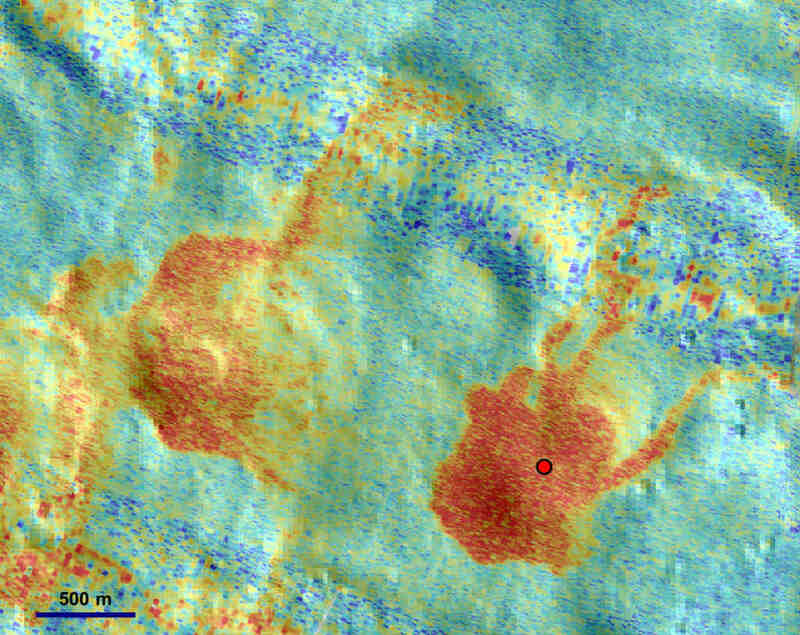 Multibeam backscatter grid draped over bathymetry surface, high backscatter values in red. Backscatter is defined as the amount of acoustic energy being received by the sonar after interaction with the seafloor. This data can be used to characterize bottom type, because different bottom types “scatter” sound energy differently. For example, a softer bottom such as mud will return a weaker signal than a harder bottom, like rock. While some surface seeps have an easily identifiable surface expression, there are many more occurrences with either very subdued or absent bathymetric response. Hydrocarbon seepage provides nutrients to chemosynthetic fauna, and also leads to precipitates such as authigenic carbonate, and, in appropriate temperature and pressure conditions, seafloor or near-seafloor gas hydrate. All of these conditions have an impact on the acoustic properties of the seafloor or the shallow sub-surface and can be identified by an elevated backscatter response. This backscatter response is the reason seep hunting works so well in the marine environment. In addition to recording the bottom return data (in the form of bathymetry and backscatter), many current generation MBES systems can record the returns throughout the entire water column. 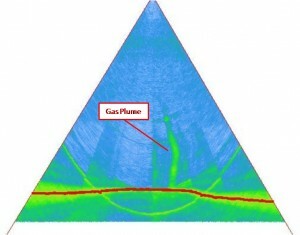 This data can be used to detect bubbles or gas plumes above the seafloor which could be indicative of hydrocarbon seepage. This plume data can be digitized and georeferenced to correlate with bathymetry and backscatter data. When combined, MBES bathymetry, backscatter and water column data give trained interpreters a powerful and cost effective tool for identifying potential hydrocarbon seep sites. Piston Coring flash animation by TDI Brooks International. Do you have Adobe Flash installed? Our vessels deployed to sample the core targets typically collect additional acoustic data with a hull-mounted sub-bottom profiler prior to core acquisition. 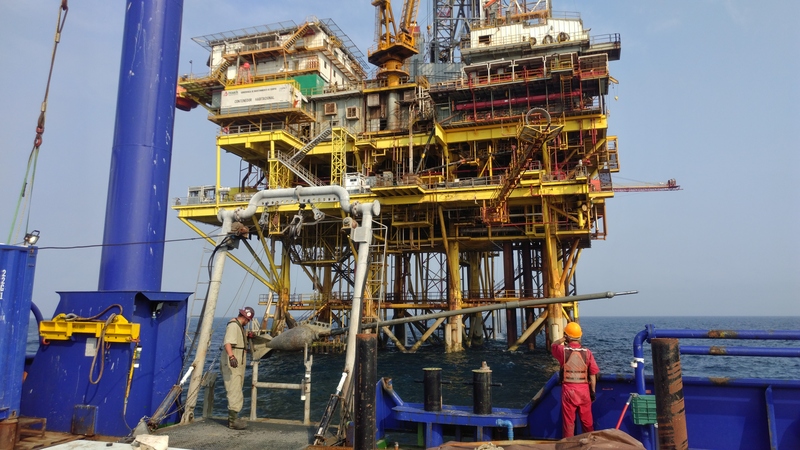 These real-time on-site surveys are used to correlate the seabed or sub-bottom feature to be cored with the corresponding seismic record used originally to high-grade the site. This process can refine the best core target location, and provides sub-bottom structure, bottom hardness, and features associated with migrated petroleum on the seabed (e.g. faults, mud mounds, fractures, upwelling features) within 1 to 2 meters. 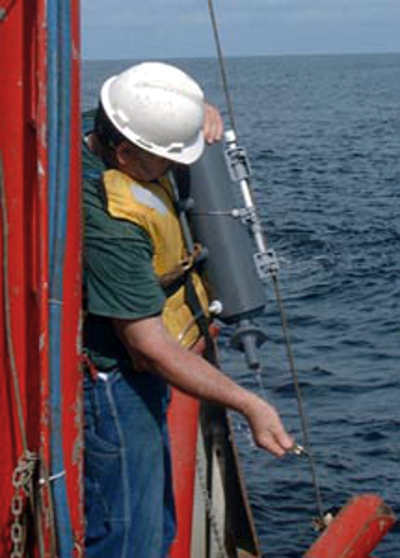 We use USBL navigated piston coring to collect the precisely located sediment core samples. Piston coring offers several advantages over gravity coring: greater penetration depths, better core recovery, and higher quality samples. Using piston coring to sample depths up to 6 meters significantly reduces intracore variability due to bioturbation, loss by diffusion of gases, and mixing of natural hydrocarbon seepage or pollution in the top meter of sea floor sediments with deeper sections of the core. In particular, the quality of information gained from measurement of sediment gases increases dramatically in sections collected deeper than about 2.5 meters. 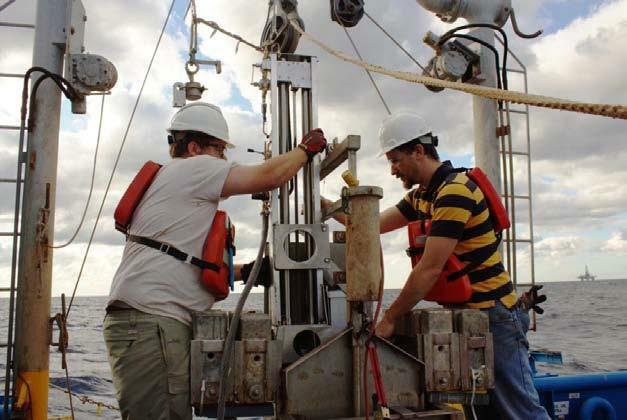 Sediment gas concentrations can change several orders of magnitude through the 2 to 5 meter depth range in marine sediments, greatly enhancing the type and quality of measurements that can be made on the samples. 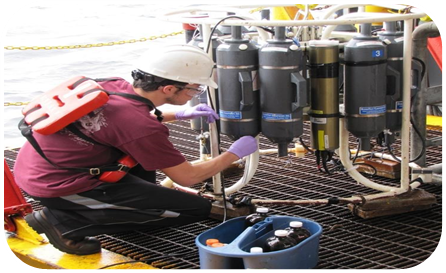 A clean shipboard laboratory area is used to process collected geochemistry cores in a hydrocarbon-free environment. Sections of the core are sampled based on a systematic sampling scheme dependent on core length. Geochemical, interstitial gas analysis and archive samples are collected from the bottom portion of each core and stored in a -20°C freezer until analysis in our Texas laboratory. Total Scanning Fluorescence (TSF), C15+-hydrocarbon Gas Chromatographic analysis (C15+GC), and Interstitial Gas analysis (IG) are typically performed on each of the three core sections to evaluate them for the presence of migrated mature hydrocarbons. TSF provides information about petroleum-related aromatic hydrocarbons contained in sediment extracts. C15+GC analysis quantifies petroleum-related normal alkanes (n-C15 to n-C34), isoprenoids (pristane and phytane), and the unresolved complex mixture (UCM) generally associated with sediment extracts that contain oil. The determination of interstitial light hydrocarbon gases (including methane, ethene, ethane, propene, propane, iso-butane, n-butane, neo-pentane, iso-pentane, and n-pentane) from canned sediment samples is useful because low molecular weight hydrocarbon gases are the most mobile phase of petroleum and, if present in the core section, are easily detected, quantified, and distinguished from local background. Samples that contain elevated concentrations of migrated petroleum based on the TSF, C15+GC, and/or gas screening data can be further analyzed for saturate and aromatic biological markers and stable carbon isotopes. These more detailed analyses can usually confirm the presence of migrated petroleum and are often used to match hydrocarbons in the sediment extract with a specific produced oil and/or source rock. Brooks, J.M., H.B. Cox, W.R. Bryant, M.C. Kennicutt II, R.G. Mann, and T.J. McDonald, l986. Association of gas hydrates and oil seepage in the Gulf of Mexico, Organic Geochemistry, 10: 221-234. 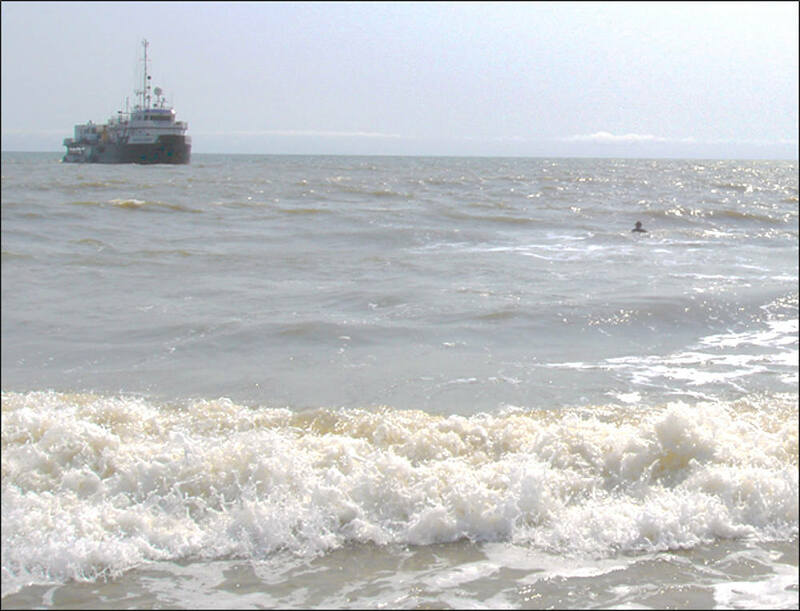 Gas hydrates were recovered from eight sites on the Louisiana slope of the Gulf of Mexico. The gas hydrate discoveries ranged in water depths from 530 to 2400 m occurring as small to medium sized (0.5–50 mm) nodules, interspersed layers (1–10 mm thick) or as solid masses (> 150 mm thick). The hydrates have gas:fluid ratios as high as 170:1 at STP, C1/(C2 + C3) ratios ranging from 1.9 to > 1000 and δ13C ratios from −43 to −71‰. Thermogenic gas hydrates are associated with oil-stained cores containing up to 7% extractable oil exhibiting moderate to severe biodegradation. Biogenic gas hydrates are also associated with elevated bitumen levels (10–700 ppm). All gas hydrate associated cores contain high percentages (up to 65%) of authigenic, isotopically light carbonate. The hydrate-containing cores are associated with seismic “wipeout” zones indicative of gassy sediments. Collapsed structures, diapiric crests, or deep faults on the flanks of diapirs appear to be the sites of the shallow hydrates. Concentrations of the C1-C3 hydrocarbons and stable carbon isotope compositions of methane in recent sediments and seep gases of the Texas-Louisiana shelf-slope region were determined. These gases have been produced by both microbial and themocatalytic processes. Microbially-produced gases consist almost exclusively of methane, having C1/(C2+C3) hydrocarbon ratios greater than 1000 and δ13CPDB values of methane more negative than -60‰. Petroleum-related hydrocarbon gases generally have C1/(C2+C3) ratios smaller than 50 and isotopic ratios more positive than -50‰. A geochemical model based on these two parameters is used to show that natural gas compositions can be altered due to mixing of gases from the two sources as well as by microbial action and migration through sediments. Bernard, B., 1978. Deep-Sea Research, Vol 26A, pp. 429 to 443. Interstitial methane profiles from six sediment cores taken on the slope and abyssal plain of the Gulf of Mexico can be explained by simple kinetic modeling. Methane is apparently produced at a constant rate and microbially consumed in the sulfate-reducing zone. Rates of production and consumption are estimated from best-fit solutions to a steady-state diagenetic equation. Production and consumption balance to form uniform concentrations of 5 to 10 µll-1 in the first few meters of slope and abyssal sediments. Effects of upward diffusion from large accumulations of methane in sulfate-free zones deeper than about 10m are not detectable. 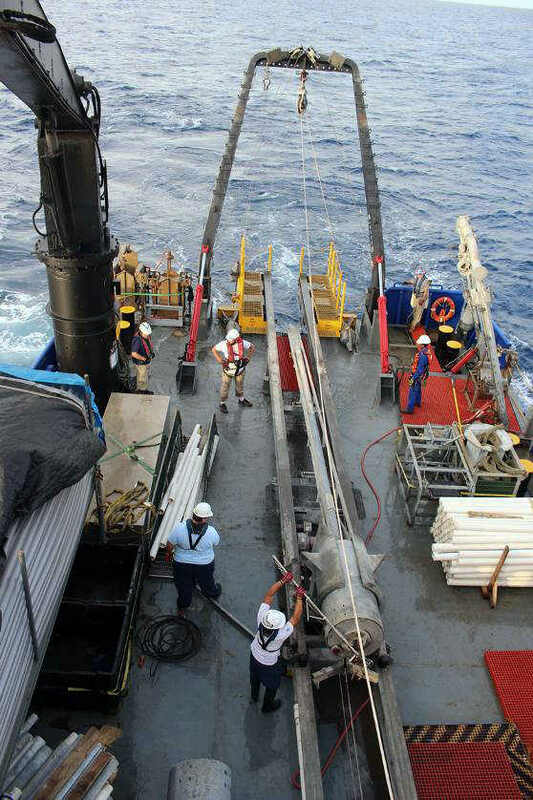 TDI-Brooks International, Inc. offers a comprehensive suite of offshore geotechnical field services, including piston coring, jumbo piston coring, box coring, and the deployment of multiple CPT tools. Our vessels can also be used to accommodate some third party geotechnical equipment packages. Geotechnical analytical services are offered to complement our field services. 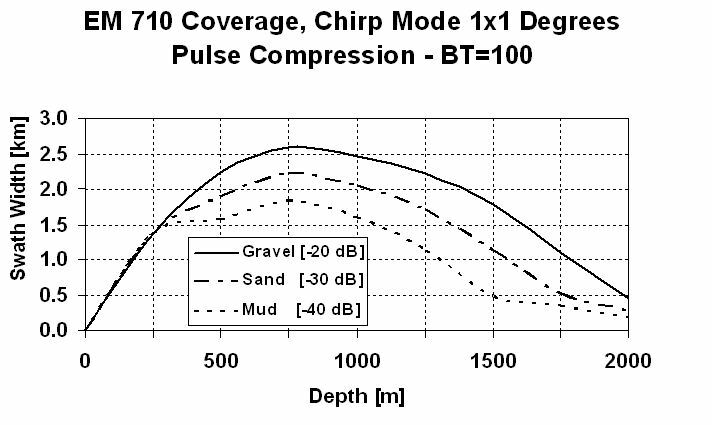 The CPT-Stinger is installed in a JPC core-head, deployed and triggered with the well-proven TDI-Brooks JPC process, and allowed to free-fall ballistically to insert itself into the sediment like a JPC. Once fully embedded in the seafloor with the necessary resulting reaction force now available, the CPT-Stinger is programmed to extend a rod from inside the barrel deeper into the formation (like a stinger) at the standard ASTM (static) cone push rate. The standard Long barrel CPT Stinger can be ballistically inserted to about 62 ft BML (while gathering dynamic CPT data), and then used to push a cone penetrometer to about 115 ft BML while gathering static CPT data. The Extended Long CPT Stinger can be inserted to about 72 ft BML (while gathering dynamic CPT data), and then used to push a cone penetrometer to about 135 ft BML while gathering static CPT data. 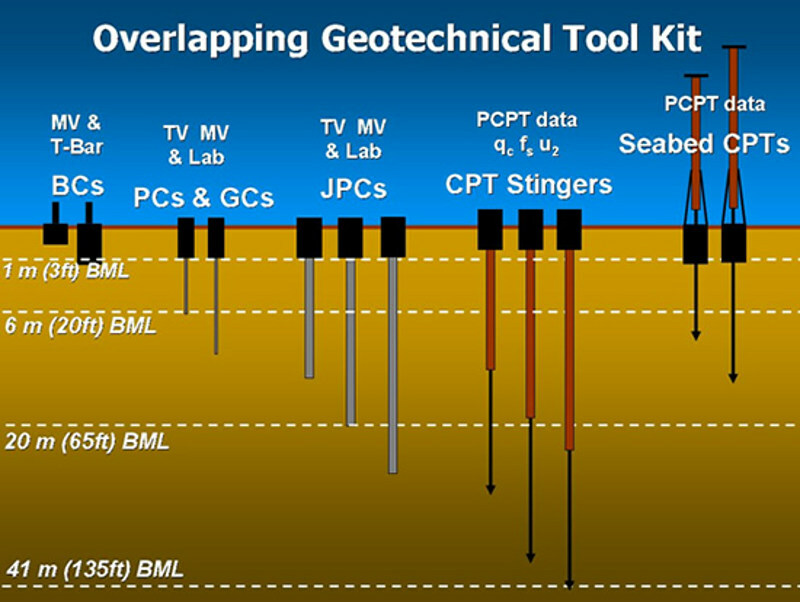 Because the extended rod is essentially as long as its barrel, in-situ CPT data can be acquired to sediment depths double of that of the barrel length of the tool (or of a corresponding JPC). The CPT Stinger has its own engineered barrel assembly, internal rod set, control module, and PCPT cone with data logger. The rig is deployed in the same manner as if acquiring a JPC. After trigger less than 1 m above the seabed, the dynamic cone data are acquired at a high rate during ballistic penetration into the formation. After penetration to full embedment, the cone data acquisition continues while the cone is slowly pushed deeper into the formation at a constant rate. During this push phase, the probe advances at a controlled ASTM rate of 2.0 cm/sec ± 0.5 cm/sec. Data from the probe are logged as the push progresses. Once complete, the system is retrieved to the vessel and data are downloaded from the probe for evaluation and analysis. The tool is then readied for the next deployment, typically in less than 20 minutes, making 3 to 5 deepwater deployments per 12-hour day routine. The tested minimum water depth for the CPT-Stinger is currently 350 m, though a shallower water capability may be possible. and pore pressure (u2) using standard ASTM dimensions and protocols for its 15-cm2 cone. the soil using downward momentum (freefall) generated by gravity. All cone channels are logged 200 times per second during this process, including calibrated acceleration for precise velocity, penetration, and tilt. Once the cone insertion into the soil is complete (within 5 sec after trigger), the tool’s precise location is recorded (using USBL when in deepwater), and then the tool is retracted from the soil and retrieved to the deck. 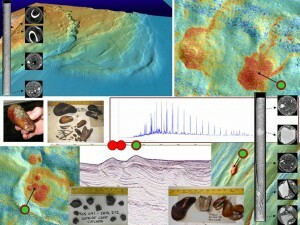 Cone data are immediately downloaded from the probe for evaluation and analysis. The tool is readied for the next deployment, typically in less than 5 minutes, making numerous measurements per day feasible, depending only on water depth and winch speed. The maximum water depth for the gCPT system is 3,000 m, but special 4,500 m cones are also available for ultra-deep tests. High quality in situ dynamic PCPT data can be rapidly acquired from the mudline to 30+ft (9+m) below the mud line in a safe, rapid, and cost-effective manner. Probe data are logged 200 times per second. This logging rate allows the cone parameters to be measured at sediment intervals no larger than 2-5 cm even at ballistic advance velocities reaching up to 10+ m/sec. 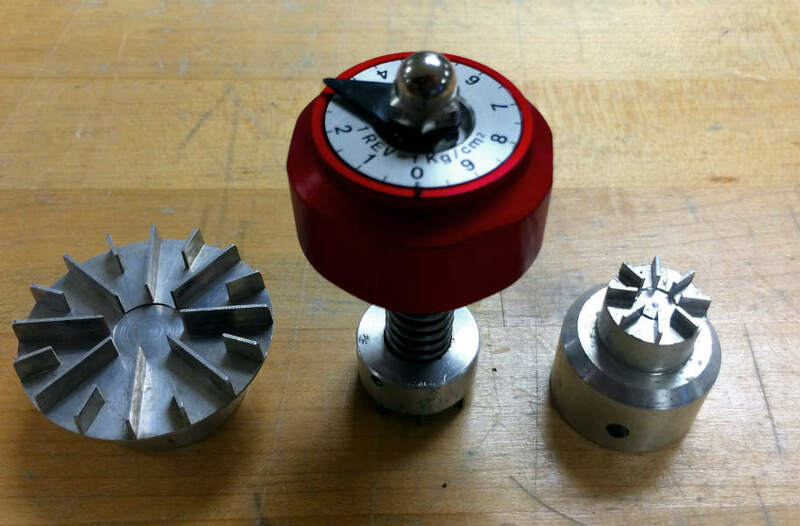 Parameters logged include tip resistance (mPa), sleeve friction (kPa), pore pressure (mPa), cone acceleration (m/sec2) and cone tilt (°) from vertical. We calibrate and adjust these dynamic cone data to static PCPT data-equivalent using our proven and calibrated database of cone rate effect measurements with soil type. Adjustments due to the advance rate effect are slight for tip resistance and sleeve friction, and negligible for pore pressure. Comparisons between side-by-side static PCPT data (2 cm/sec ASTM-rate cone advance) with the rate adjusted dynamic PCPT data acquired during the tool’s insertion have been remarkably good for more than 400 sites in our international database. The TDI-Brooks jumbo piston coring (JPC) system consists of various hardware assemblies designed to be fastened together into a working core rig and deployed to the seabed for extracting a “jumbo” piston core. The deployed core rig comprises assemblies for the core head, the core barrel, the piston, and the trigger system. 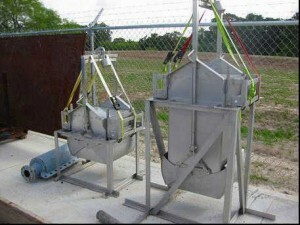 The JPC rig can be assembled to collect a sample up to 64 feet long. There is also lifting assembly that attaches to the trigger system, allowing the system to be deployed with an A-frame. The core barrel assembly is made up of selected sections of core barrel, connecting collars, a core liner assembly inside the barrel assembly, a core catcher, a core cutter, and set screws to hold the barrel assembly together. The inner diameter of the core liner is 4 inches. The barrel length can be adjusted in 5-foot and 10-foot increments by adding barrel sections and connecting collars. The trigger assembly is made up of the trigger arm, pendant clamp, trigger weight, trigger wire, and trigger wire connecting system. The assembled core rig weighs between 5,500 and 7,000 lbs, depending on the length of core to be acquired. The weight of the core head is adjusted by adding weight as lead ingots to a starting weight of about 5,000 lb. The main winch, main-line rope, and the stern A-Frame are used for deploying and retrieving the JPC rig. In addition to the deployed hardware, several assemblies are mounted to the vessel working deck to manage the deployment and retrieval of the coring rig. These assemblies include the main sheave from the stern A-Frame and the deployment, retrieval and trigger tugger winches with their hydraulic power pack. The TDI-Brooks 3-inch-diameter (3-in.) piston coring system consists of various hardware assemblies designed to be fastened together into a working core rig and deployed to the seabed for extracting a piston core. 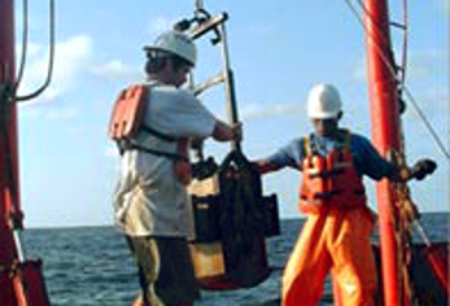 The PC rig can be assembled to collect samples up to 30 feet long and collects a 3 inches diameter sample. The deployed core rig comprises assemblies for the core head, the core barrel, the piston, and the trigger system. The core head assembly is made up of a lead-weighted core head with nosepiece and a coupling with which to attach lengths of core barrel sections. It also has a lifting flange assembly that attaches to the trigger system. The trigger assembly is made up of the trigger arm, pendant clamp, trigger weight, trigger wire, and trigger wire connecting system. The core barrel assembly is made up of selected lengths of core barrel sections, connecting collars, a core liner inside the barrel assembly, a core catcher, a core cutter, and set screws to hold the barrel assembly together. The barrel length can be adjusted in 5-foot increments by adding 5 or 10-ft barrel sections and connecting collars. The main winch, main-line coring rope, and the starboard A-Frame are used for deploying and retrieving the 3-in. piston core rig. In addition to the deployed hardware, several assemblies are mounted to the vessel working deck to manage the deployment and retrieval of the coring rig. These assemblies include the main sheave from the starboard A-Frame and the core-head and trigger tugger winches with their hydraulic power pack. A piston corer uses a free fall of the coring rig to achieve the desired initial force on impact, and a sliding piston inside the core barrel to reduce inside wall friction with the sediment and to assist in the rapid evacuation of displaced water from the top of the corer. These elements act in concert to maximize core recovery. 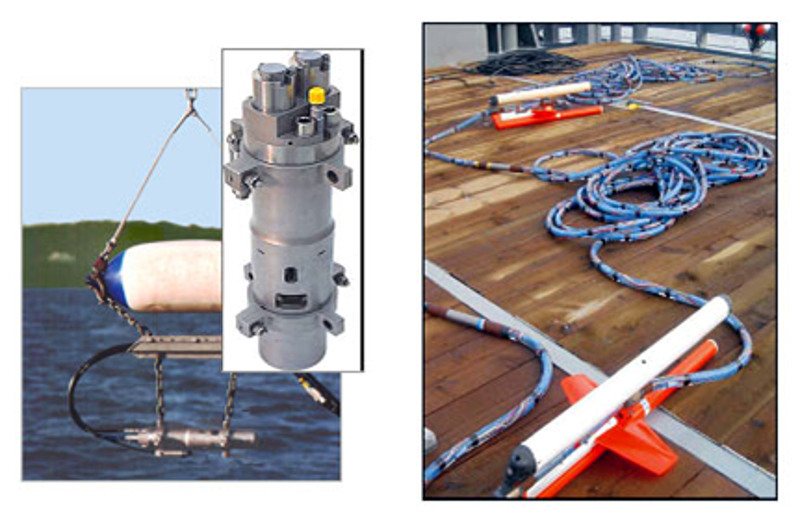 The TDI-Brooks box coring system consists of hardware assemblies designed to be rigged together into a working core rig and deployed to the seabed for extracting a standard cubic box core. Such a core is 100-cm (depth) x 50-cm x50-cm or 50-cm (depth) x 50-cm x50-cm in size. 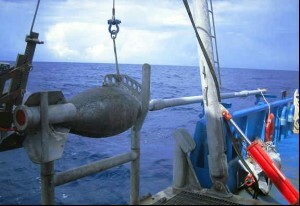 The main winch, main coring rope, and the starboard A-Frame are used for deploying and retrieving the box core rig. Our box coring system is designed to be a safe, simple, effective mechanism for acquiring large-volume undisturbed shallow sediment samples from the seabed. Such samples are essential for the accurate determination of geotechnical characteristics of marine sediments and the assessment of the benthic ecology (infauna) as required in environmental impact assessments. The sample box of the core rig is fabricated from stainless steel and is clean and smooth to minimize frictional resistance between the box and the sediment. The corers have a variable weight capability so that the weight stack can be adjusted to suit different seabed conditions that may be encountered. The TDI-Brooks Auto T-Bar instrument measures the progressive resistance of a soil column to a cylindrical rod (shaped as an upside-down T) as it advances down the soil column at a constant and standard rate of travel. The instrument is shown in Figure 9, with its T-bar protruding below. 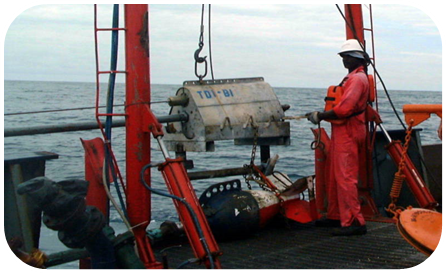 Operation consists of mounting the instrument onto a box corer containing an undisturbed seabed soil sample, connecting the instrument to a shipboard source of compressed air, and starting the automatic advance of the T-Bar into the soil sample. The resistance of the soil is automatically logged during the downward advance until the bottom of the soil sample is reached by the T-bar. The instrument then reverses T-bar movement and logs the soil resistance generated during the upward, retracing return of the T-bar back up to any desired soil depth or to the surface. This sequence of a downward stroke followed by upward re-trace through the failed soil can be continually repeated as many times as desired. Sets of 10 to 30 such cyclic T-bar tests are typical in box cores. The instrument measures and logs the soil’s resistive force on the T-bar 10 times per second. The T-bar typically auto-advances at 2.0 cm/sec, so a data set is logged every 2 mm of penetration (this standard rate of advance can be changed to address differing client specifications). A single down-stroke test to 100 cm soil depth thus takes 50 seconds with 500 resistive force measurements logged (Table 1). The resistive force is reported in pounds or newtons, and is converted by the processing program into units of pressure (ksf or kPa) by dividing by the cylindrical cross-sectional area of the T-Bar. The standard (medium) T-Bar cylinder diameter is 1.00 in. and its length is 5.00 inches. Smaller T-bars (0.75 in. and 0.50 in. dia.) are also available for quick change-out, each with cylinder length 5 times its diameter. The push rod is sleeved, rendering its frictional drag during advance in either direction to have no measureable component. The calibrated range of the tool is -100 lb (445 N) upstroke to +100 lb downstroke, which translates using an Nt-bar of 10.5 to maximum measureable undrained shear strengths of about 275 psf (13.2 kPa) using the large bar, 500 psf (23.9 kPa) for the medium bar, and 1,100 psf (52.7 kPa) for the small bar. An example of 30 cyclic auto T-bar measurements into a 1m deep box core sample are plotted in the figure below. In this figure, the pink trace represents the initial downward stroke of the T-bar into the soil. The two (right and left) nested sets of blue traces are the subsequent progressive upstroke and downstroke data, with the inner traces being the 30th and final stroke set. 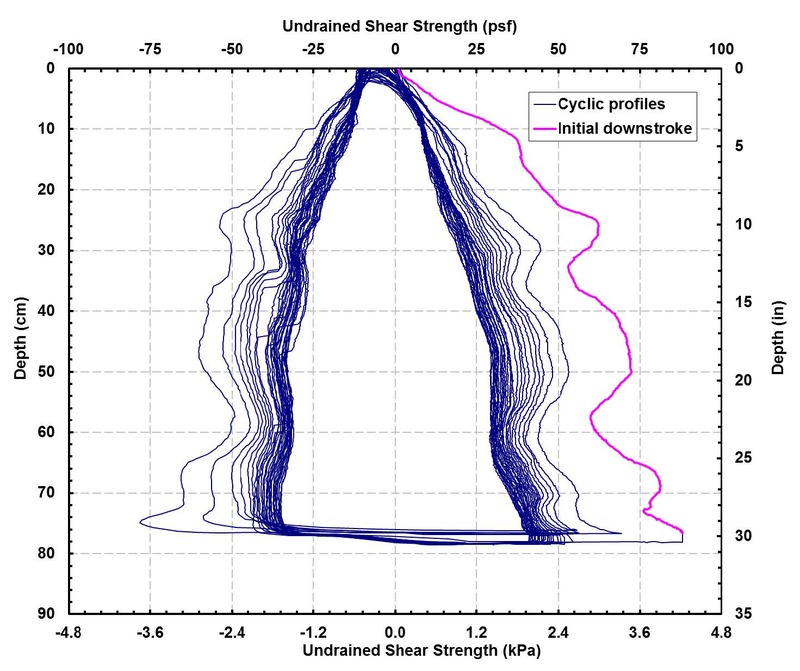 All measurements have been converted using an Nt-bar of 10.5 to represent undrained shear strength. This plot illustrates the progression of soil reworking toward fully remolded character during the course of the 30 sets of strokes. Such a data set can thus be also used to project fully remolded values at selected soil depths. Auto T-bar Specifications available upon request. We have a comprehensive geotechnical laboratory to supplement our acquisition services. The lab is headed by Nick Clark. Heat flow measurements serve critical purposes in oil exploration and production. The measured background or equilibrium heat flow, and measured sediment thermal conductivity provide strict constraints to geochemical models that determine regional scale maturation of basins with respect to oil and gas. In addition, area-wide heat flow surveys provide significant geological information on fluid flow from faults, lineaments, and around structures. Heat flow measurements in conjunction with seismic and sea floor geochemical studies provide a mechanism to assess fault and structural seals and contribute to a better understanding of regional hydrodynamics and hydrocarbon occurrence. 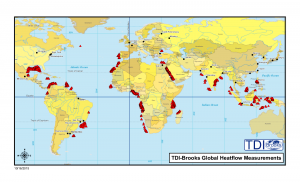 TDI-Brooks International has performed heat flow studies across the world. The map to the left shows the many locations we’ve collected heatflow measurements. 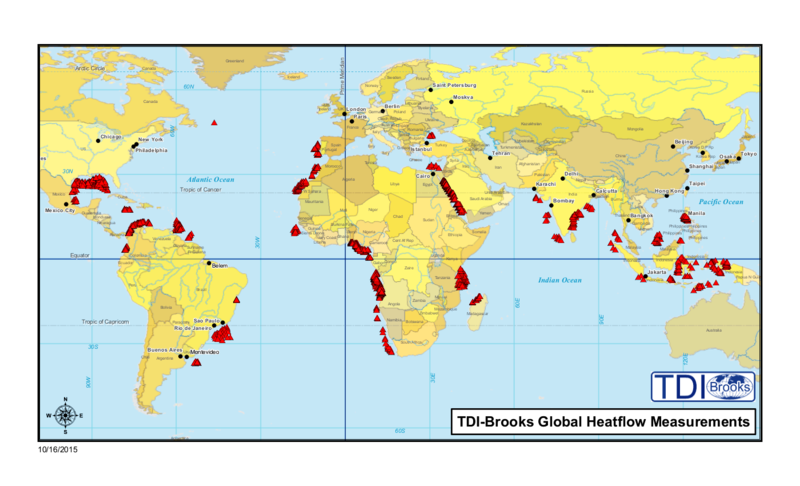 TDI-Brooks International’s heat flow probe performs heat flow surveys in water depths up to 6000 m. In addition to measuring the sediment temperatures, the probe measures in situ thermal conductivity and water temperature profiles. The probe is capable of multiple measurements during a single 12-24 hour deployment. 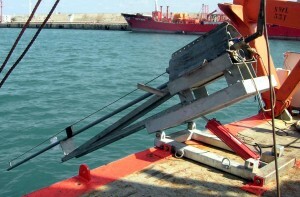 This one ton instrument is deployable from sea going vessels or platforms with a suitable winch and deployment system. The heat flow in a region is due to heat moving upward from the mantle, together with thermal input from the radioactive decay of long-lived, naturally occurring isotopes in the earth’s crust. This conductive thermal regime is easily perturbed by the movement of fluids, which is the most effective form of heat transport. Thus, heat flow anomalies are indicative of recent or ongoing fluid flow in a sedimentary basin. Heat flow variations may also provide insight into basin stretching, sedimentation rates, and the presence of salt. Salt has a high thermal conductivity and thus enhances heat flow and perturbs maturation patterns and hydrodynamics around salt structures. In addition, the geotechnical stability of the ocean floor can be addressed as measured temperatures can determine the stability of gas hydrates in shallow sediments. 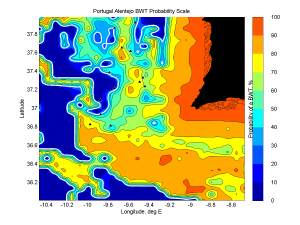 Figure 10: Probability of a BWT transient offshore of Portugal. The heat flow sites are denoted with a black triangle. The temperature of the ocean water overlying the bottom, known as bottom water temperature (BWT), plays an important role in obtaining a reliable heat flow estimate. Understanding how changes to the BWT can affect a computed heat flow value is very important. If the BWT cools or heats suddenly, then this sends a temperature anomaly propagating by conduction downward into the sediments. Sometimes such changes in the BWT are responsible for large, non-linear temperature variations over the length of the 5-m probe, particularly at shallow water sites. TDI-Brooks recommends that heat flow be conducted in depths greater than 600-800m because of the high risk of a BWT variation in shallow water. Normally in the deep ocean the BWT is fairly stable with depth, and varies only slightly in time. This is conducive to highly accurate and precise heat flow measurements. But BWTs may not be stable at any depth depending on the oceanographic factors. Bottom water temperature transients have typically been identified after the fact, by recognizing a deviation from linearity in the Bullard plot and then explaining the deviation as a probable transient in the temperature of the overlying water. But it is possible to examine the bottom water temperature output of a real-time ocean model and pro-actively identify potential sites where transients could be expected to be a problem. TDI-Brooks has the capability to classify whether a potential heat flow site may be subject to a transient in the bottom water temperature. The method will correctly classify a heat flow site as stable or unstable with an accuracy exceeding 90%. For example, Figure 1 shows the computed probability of a BWT transient offshore of southern Portugal. This region is influenced by the warm and highly saline Mediterranean Outflow Water flowing out of the Gibraltar Strait and to the northwest over the Portuguese margin. The Outflow occurs between 500 and 1400m and affects the BWT of sites typically considered to be deep. Table 1 provides the specific details found by our method. The column labeled Bullard Plot shows if a transient was detected in the Bullard Plot. The column labeled Computed BWT Probability shows the computed probability of a transient. A probability greater than 30% is highly indicative of a transient. 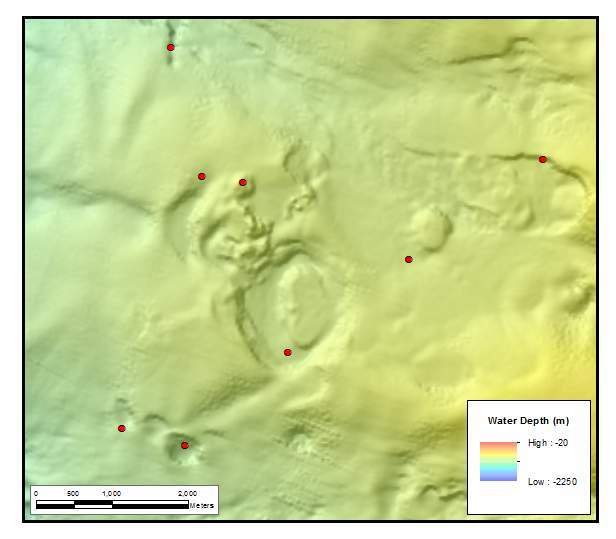 None of the site depths were less than 1100 m, yet all but two were affected by a transient. The method correctly identified eleven of the twelve sites, or 91%. For more information, or a copy of the technical note (click here to download) further describing the method, please contact Dr. Les Bender at +1 979.693.3446 or lesbender@tdi-bi.com. Since inception of the EBS concept in the early 1970’s, TDI-Brooks International’s scientists have been performing EBSs for clients in the most rigorous regulatory environments. Decades of experience in refining techniques, working with regulatory agencies, and developing a functional network of specialists/associates provides our clients with an effective and defensible approach to resolving environmental impact issues in the marine environment. Environmental Baseline Studies are often required in offshore prospects as a defense against potential litigation, to satisfy leasing stipulations, and as good faith measures in responsible environmental stewardship. When performed in conjunction with TDI-Brooks’ SGE surveys, TDI-BI is able to leverage our experience, logistical support, and presence to provide cost effective EBSs conducted under the stringent HSE standards that industry demands, thereby providing our client with timely solutions to environmental concerns backed with the highest scientific and technical credibility. Our scientists have held key roles in the most high profile, prestigious Environmental Impact Assessment projects both in the US and internationally. Our client history includes USEPA, BOEM (formerly Minerals Management Service), National Oceanic and Atmospheric Administration, Office of Naval Research, and US Fish and Wildlife Service. TDI-Brooks International, Inc. provides full arrays of hull-mounted and towed sensor acquisition systems to perform hydrographic and marine geophysical surveys around the world safely, effectively, and economically. We have the global experience, knowledge and resources needed for any marine site survey investigation. We employ an experienced team that includes hydrographers, geophysicists, geologists, oceanographers, mariners, cartographers, and GIS and CADD specialists working with our own vessels and equipment, producing surveys and deliverables of the highest quality.geochemical and heat flow programs, environmental assessments, metocean, site surveys and seabed surveys. 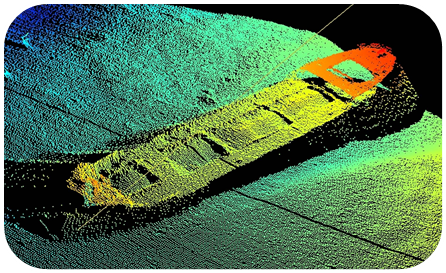 Hydrographic Marine Surveys are critical to any site investigation and/or seabed mapping project. 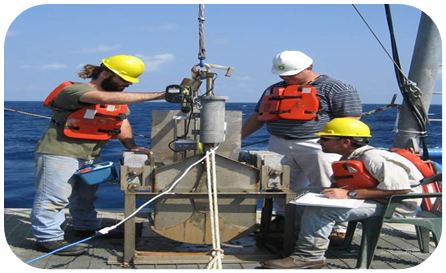 Hydrographic survey is the science of measurement and description of features which affect maritime navigation, marine construction, dredging, offshore oil exploration/offshore oil drilling and related activities. Strong emphasis is placed on soundings, shorelines, tides, currents, seabed and submerged obstructions that relate to the previously mentioned activities. 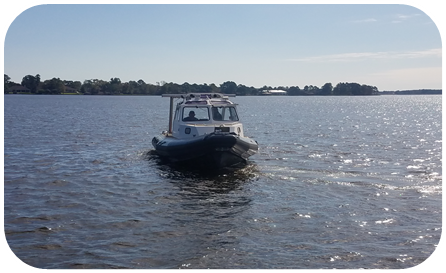 Each TDI-Brooks vessel uses its multibeam echo sounder to conduct hydrographic surveys. Multibeam sonar measures the depth of the sea floor by analyzing the time it takes for sound waves to travel from a boat to the sea floor and back. In addition to our onboard services, we offer portable tool kits which can be shipped to any vessel of opportunity. 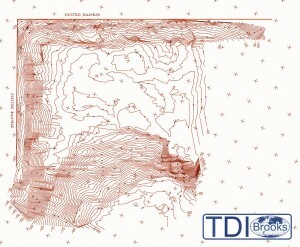 TDI-Brooks has conducted a number of high profile marine surveys (hazard, bathymetry, shallow 2-D seismic, etc) . 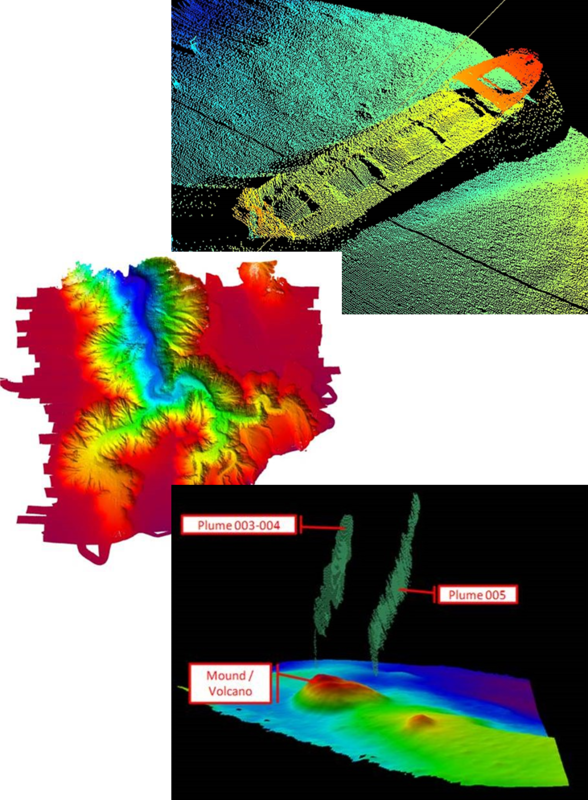 A hydrographic survey is usually focused on obtaining high quality bathymetric data of the seabed. 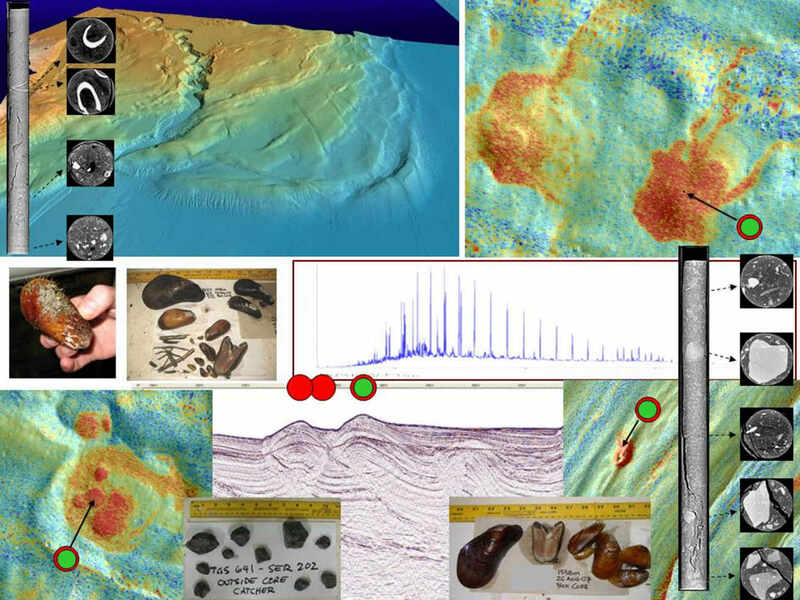 Acquisition of hydrographic and geophysical data primarily uses a range of acoustic-based instruments to characterize the seabed, shallow soils and geology. 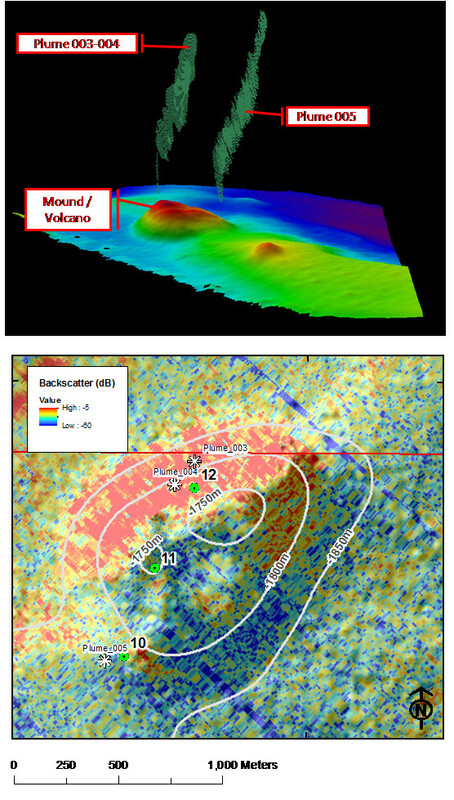 A geophysical survey involves a number of data requirements including water depths, seabed topography, seabed and sub-seabed obstructions, seabed soils, shallow geology and ground conditions and identification of any man-made and naturally occurring hazards that may adversely impact the objective of the site investigation (geohazards). 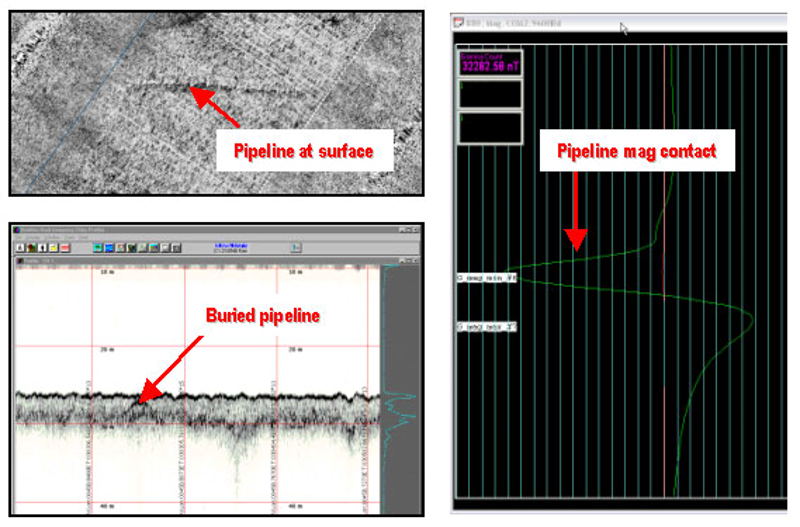 Identification of existing pipelines using sub-bottom profiler, side scan sonar and magnetometer. TDI-Brooks International keeps a complete set of portable field equipment on hand. We have the capability to quickly mobilize for offshore coring and field sampling operations on virtually any suitable vessel. For further information, please contact us. TDI-Brooks’ can also provide portable tool kits to include a Geometrics GeoEel 48 channel Digital Streamer system. The GeoEel system is a lightweight fully digital marine seismic streamer system designed for application to a wide range of surveys, including oil and gas exploration, gas hydrates surveys and a variety of special engineering surveys. The GeoEel system is a lightweight fully digital marine seismic streamer system designed for application to a wide range of surveys, including oil and gas exploration, gas hydrates surveys and a variety of special engineering surveys. 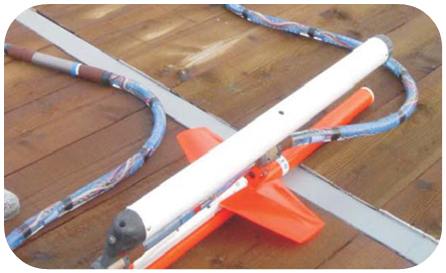 In addition to towed streamer seismic applications, the GeoEel is also suitable for use as a bay cable in shallow water transition zone regions. The GeoEel streamer and on-board data acquisition system is very portable and easy to mobilize for installation on small shallow draft survey vessels for operation in shallow water less than 10 meters, or on larger reel equipped deep water vessels. The acquisition system can be configured for use with almost any type of marine impulsive source. We also have the Sodera Mini GI Air Gun (60 cu in), and an Alpha Seismic ASC100D 100 SCFM compressor. 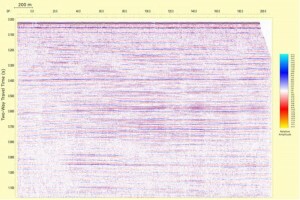 Both single source and multi-source arrays can be deployed for a variety of seismic data requirements. Data acquired using Geometrics 48 channel GeoEel digital streamer system (600 meters active length), and a 60 cu in GI Mini Gun. Workplatform: 10″ off deck on grating. TDI-Brooks International extends its full suite of deep water acquisition services to shallow water, the transition zone and onshore. Such services include geotechnical, geochemical, environmental and general surveys with comprehensive reporting. Our expertise lies in acquiring the highest quality, cost effective data from the most challenging areas around the world. 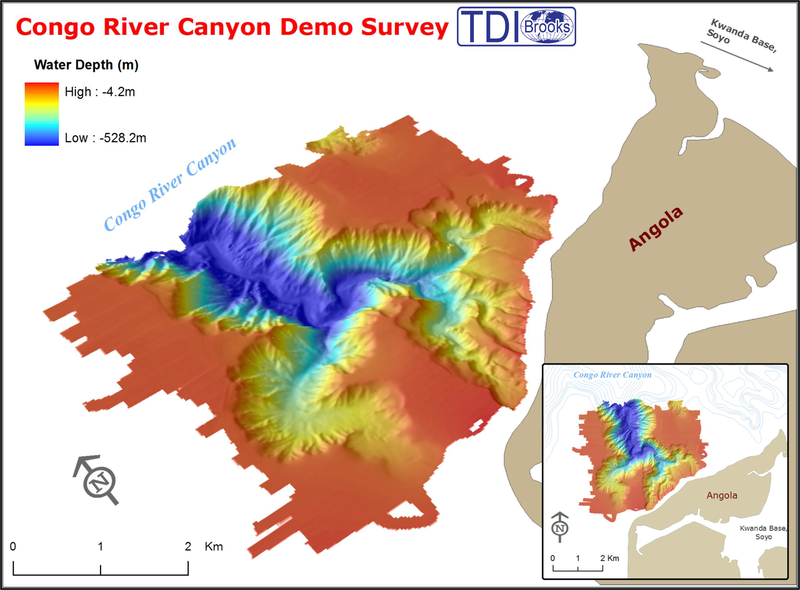 TDI-Brooks has over twenty years involvement in shallow water and transition zone geochemical and environmental assessments as well as numerous environmental baseline studies, especially in remote areas of West Africa. Decades of experience have refined techniques, and from working closely with regulatory agencies, and by developing a functional network of specialists/associates, we provide our clients with an effective and defensible approach to resolving Environmental Impact issues in the marine environment. 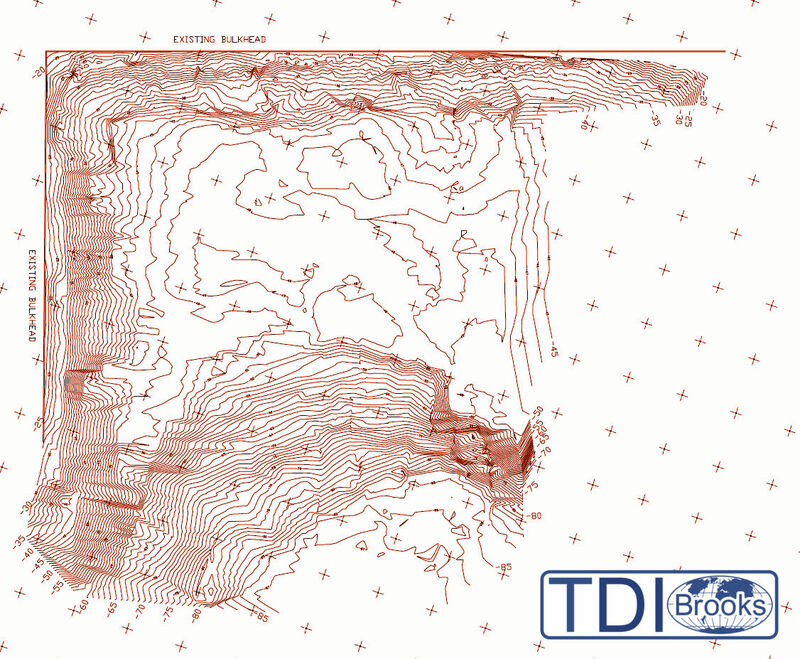 Geotechnical acquisition services in conjunction with well-equipped local or US based partners will be supported by TDI-Brooks existing Geotechnical laboratory and GIS services. 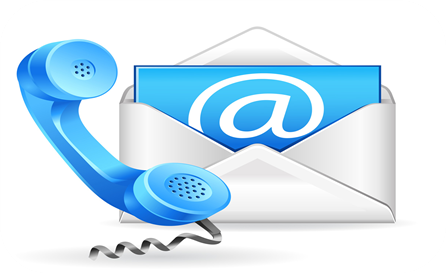 Furthermore all levels of reporting can be provided with the assistance of our engineering partner network. Buttressing advanced surveys are the basic surveys and data reporting which we provide. Such basic surveys include hydrographic, topographic, cadastral and boundary surveys. As well as; dredging, constructability and hazard surveys, pipeline and flowline corridor, construction, and post lay including depth-of-cover, and as-built surveys. Our personnel, processes and equipment follow established guidelines and industry best practices to perform work within environmentally sensitive wetlands, intertidal areas, surf zones, coastal waters, and rivers.